The exuberant and evergreen mountains with 140 and 400 kilometers high surround the small town of Viñales, settled in 1607. It inhabitants has developed agriculture mainly the tobacco growing. It is a typical town of the provinces of Cuba that keeps its marked colonial appearance. On the outskirts, there are several typical peasant houses (bohios) scattered throughout the valley, with its corresponding sown fields and tobacco plantations. 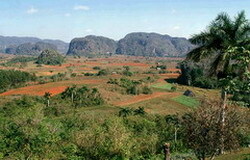 In the Viñales Valley it is found the greatest cavern system of Cuba, one of the most extensive of the western hemisphere with 18 kilometers of galleries, most of them accessible. Among them, we have the Cueva del Indio, discovered in 1920 and became a tourist attraction since 1951, it is crossed by the San Vicente River and navigable inside the cave through 500 meters. Also, the Palenque of Cimarrones is a kind of museum with restaurant services, reproducing an entrance to the cave that goes through one side and to the other of the mountain, a small village of African slaves on the run (palenque) which was very common in this part of the country due to the protection offered by the natural conditions of the place. However, not even within so many natural beauties, man does not overlook his creative mark, fortunately, in this opportunity, in perfect harmony with the environment. The Mural de la Prehistoria is a great painting 180 meters wide and 120 meters high with the sign of Leovigildo Gonzalez, disciple of the Mexican muralist Diego Rivera. The author took advantage of the vertical wall of the one of the mountains to try to explain, with prehistoric animal pictures that lived in the area, the geological evolution of the Sierra de los Organos, a geographical area where Viñales is located. The mural was made between the years 1959 and 1962 and restored in the eighties using more resistant products to the inclemency of nature. In the area around the valley, the San Vicente river offers spring waters of hypothermal waters that rise from the small mountains of the same name. Other treasures are found in the lands of this famous valley, between hotels and motels, camping, Habano houses, restaurants, lakes, autochthonous flora and fauna, it is a paradise in a Cuban piece of land.